The requirement of good conduct certificate for foreign workers in UAE is currently the hottest topic in UAE that has even left behind VAT (value added tax) for now. Emigrants from different parts of the world will be affected by these new rules imposed by the UAE government in order to make UAE a safer place for its citizens and residents. Indians are the largest foreign nationals present in UAE and they are comprised of 27% population of the country. Most of these Indians are living as workers and there is potential of more and more Indian nationals to enter UAE as workers for various jobs. Therefore, Indians will be most affected with this latest decree and now it is mandatory for them to get good clearance certificate from India (or their country of residence where they are staying for the past 5 years). Following is the complete process of getting good conduct certificate for those Indians already working inside UAE. It is important to note that Indians who want to apply for work visa for UAE can get good conduct certificate from their nearest police station and related department. 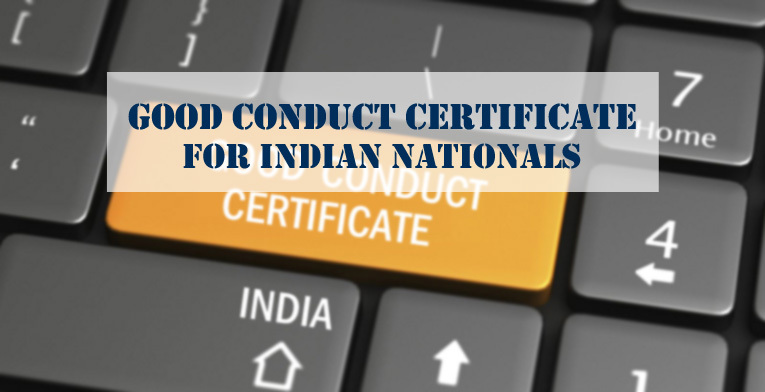 These are the most important points to acquire good conduct certificate for Indians working in UAE. It must be remembered that work permit will only be issued after approval of good conduct certificate that will prove that you are not involved in any criminal activity at least in the past 5 years. If you are facing problem in understanding the full procedure or you need practical assistance in this respect, you can contact Riz & Mona Consultancy for complete guidance. Our experts are always available to help you via WhatsApp # 971-56-9971225.